Israeli prime minister Benjamin Netanyahu is paying a heavy political price for the cease-fire with Hamas that he approved last week, ending a round of violence that had threatened to escalate into another costly war in Gaza. So far, however, it has yet to topple his current government. Bennett had issued an ultimatum last Wednesday that he would resign if Netanyahu did not hand him the defense minister position abruptly vacated earlier that day by Avigdor Lieberman, chairman of the Yisrael Beiteinu Party. Lieberman and Bennett, whose right-wing nationalist constituencies have played a growing role in Netanyahu’s governing coalition since 2009, were outraged at the cease-fire. They characterized it as a capitulation to terrorism, having long advocated for a more heavy-handed approach to Hamas. Netanyahu balked at that demand, saying he would take over the defense portfolio himself. He then spent the next few days exercising his considerable chops as a political spin doctor, hammering on the talking point that it was irresponsible to create a leadership vacuum in the midst of a national security crisis. He made allusions to security threats beyond what the public could see and reminded his fellow right-wingers that the last two times a coalition led by his Likud Party was felled by internal squabbling, the outcomes of the ensuing elections were the left-wing governments that presided over the Oslo Accords and the Second Intifada. This “don’t swap horses” message seems to have gotten through to Bennett and Shaked, who echoed those sentiments at Monday’s presser, contrasting their ostensibly principled decision to remain in leadership with Lieberman’s abdication. “We will not flee from responsibility,” Shaked said. At the same time, however, Bennett took the opportunity to enumerate his many disagreements with Netanyahu’s security strategy and suggested that the prime minister had made concessions to this end on Sunday. 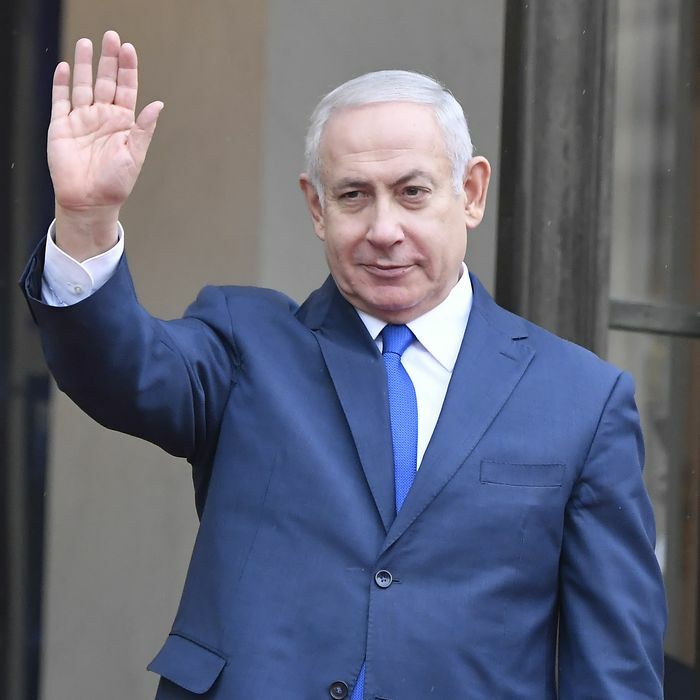 Being a much more talented politician than any of his rivals, Netanyahu may have won Monday’s news cycle; the future of his government, however, remains in serious doubt. The opposition in the Knesset has scheduled a vote for Wednesday to force early elections, but that will require at least one or two coalition members to defect and take responsibility for toppling the government. Finance minister Moshe Kahlon and interior minister Aryeh Deri, the heads of the center-right Kulanu and the ultra-Orthodox Shas Party, urged the prime minister to call early elections last week; they may or may not be willing to back up that sentiment with a vote of no confidence. Meanwhile, a series of polls over the past few days have shown at least plurality support for early elections among the Israeli public, which overwhelmingly disapproves of how the government handled the Gaza crisis. Even assuming Netanyahu isn’t forced into early elections this week or this month, he’ll still be stuck with a bare majority of 61 out of 120 Knesset seats, which will prevent him from advancing major legislation and leave him vulnerable to legislative blackmail. He also has some big challenges coming his way, like a contentious debate over a draft law that would end ultra-Orthodox men’s exemption from military conscription and a plan from his friend President Donald Trump for ending the Israeli-Palestinian conflict, which is expected in the coming months. That proposal will surely be extremely disadvantageous to the Palestinians, but any concessions it requires from Israel might still be unacceptable to Netanyahu’s ultranationalist allies. Also hanging over his head is the possibility that the attorney general indicts him early next year in one of several corruption cases in which he is implicated. With all that going on, Netanyahu will probably not have the luxury of holding out until next November’s regularly scheduled national elections, so his goal now is to call snap polls at a time of his choosing, rather than being forced into them by circumstances that benefit his rivals. The more time he can buy, the more of his popular support he might be able to win back. Likud remains solidly ahead in the polls, so Netanyahu would likely emerge as the head of the next government anyway — but there’s a vast difference between a 61-seat and a 68-seat majority. Also, the Israeli political scene changes quickly these days, with new parties forming each election cycle and public figures entering the fray who could change the electoral math considerably, depending on whether they decide to run and with whom. Chief among these wildcards are former IDF chief of staff Benny Gantz, who may run as the headliner of a new party, and Orly Levy-Abekasis, a sitting Knesset member who defected from Yisrael Beiteinu in 2016 and announced earlier this year that she was forming a party of her own. In Israel as in the U.S., however, the truism holds that the left falls in love while the right falls in line. In all likelihood, Israeli political analyst Ben Caspit predicts, some of the same Cabinet members who have quarreled so intensely and publicly with Netanyahu will ultimately hold their noses and rejoin the fold out of fear of losing the nationalist coalition’s hold on power. A well-timed election could also help Netanyahu with his legal troubles, Caspit notes, as the attorney general would be hard-pressed to bring charges against the prime minister either right before an election or soon after one in which he was reelected. Barring an indictment, it’s hard to envision a scenario in which Netanyahu doesn’t win at least one more term. Israel’s prime ministry has no term limits, so Netanyahu can continue to occupy his office as long as he remains the head of Likud and Likud keeps winning elections. The problem is that while he has many rivals, both inside and outside his party, he has no real competitors: nobody with the popularity, charisma, and political skill to win elections as consistently as he has. Yet the ultranationalist faction represented by Lieberman, Bennett, and Shaked is still winning the long game. The rightward turn of the Israeli electorate, combined with the chronic malaise of the center and the left, suggests that a fifth Netanyahu government is probably in the offing, but popular frustration with the stalemate in Gaza and the rising tide of nationalist sentiment suggest just as strongly that the far right will play a major role in shaping that government’s policy priorities.